The oriental cockroach (Blatta orientalis), also known as the waterbug, is a large species of cockroach, adult males being 18–29 mm (0.71–1.14 in) and adult females being 20–27 mm (0.79–1.06 in). It is dark brown to black in color and has a glossy body. The female Oriental cockroach has a somewhat different appearance from the male, appearing to be wingless at casual glance but has two very short and useless wings just below her head. She has a wider body than the male. The male has long wings, which cover two thirds of the abdomen and are brown in color, and has a narrower body. The odd male is capable of very short flights, ranging about 2 to 3 meters. 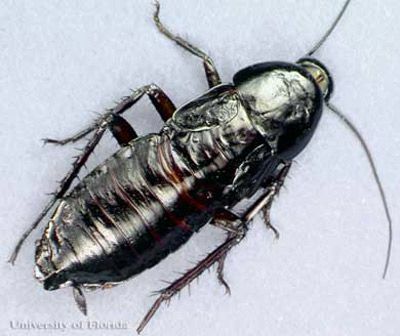 The female oriental cockroach looks somewhat similar to the Florida woods cockroach, and may be mistaken for it. Originally endemic to the Crimean Peninsula and the region around the Black Sea and Caspian Sea, its distribution is now cosmopolitan. In order to thrive, cockroaches need a place to hide. They prefer warm places and a relatively high humidity if possible; they also need a source of food/liquid. The optimum temperature for oriental cockroaches is between 20 °C (68 °F) to 29 °C (84 °F). Female oriental cockroaches have vestigial tegmina (reduced forewings) and males have longer tegmina. Signs of cockroaches are their oothecae, which are “egg cases”. The blackish brown oothecae of the oriental cockroach are 10–12 mm (0.39–0.47 in) long, with indistinct egg compartments housing 16–18 eggs.